The two-story building contains four self-contained suites of rooms, two suites on each floor. 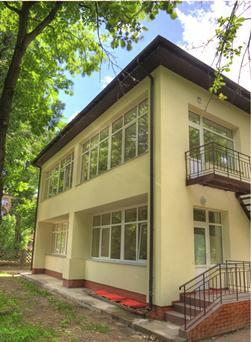 Each suite is designed to accommodate eight to ten youngsters with comparable needs, but the school opened with only nine children in the fall of 2010 as Ms. Struchek, a local woman with some foreign training in working with autistic children, prefers to gain experience in the facility and with other teachers before expanding to full capacity. The intent is to open the school to a broad range of autistic youngsters, not just Jewish children. Jewish content is available for Jewish families, but the Jewish atmosphere is discreet. A portion of the Markovich school for autistic children is seen at right. The school grounds are expansive and most of its territory is enclosed by a fence. Ms. Struchek said that the nine enrolled children range in age from three to ten. The school day begins at 8:00 a.m. and concludes at 6:00 p.m. Additionally, said Ms. Struchek, the school has accepted a small number of children under three years of age who receive individualized attention for several hours every day. The primary aim of the school is the acquisition of social skills that will permit children to engage in formal education, separate from their parents, and, if possible, integrate into a regular school. The program employs specialists in psychology, child development, speech, and other fields. Certified teachers in conventional school subjects teach those youngsters who are ready for such instruction. Atten-dants are employed in order to provide each youngster with individual super-vision when he or she is not receiving therapy or personalized instruction. Each child was accompanied by an atten-dant during a school program. Photo:http://www.cwf.com.ua/. Retrieved July 26, 2011. One of the critical problems in Ukraine regarding autism, stated Ms. Struchek, is that the condition often is diagnosed very late, sometimes only when a youngster has been expelled from a conventional school for misconduct. Pediatricians have not been trained to recognize symptoms in early childhood. Sometimes parents who approach pediatricians or other medical specialists upon observing that their child is not developing normally are treated in a crude manner. Not all families are sufficiently sophisticated or have enough resources as Mrs. Sergienko, who took her child to Israel for evaluation at the age of two. Ms. Struchek observed that most families with autistic children become isolated because their children require constant attention and cannot be taken anywhere due to their odd behavior and an unsympathetic public. 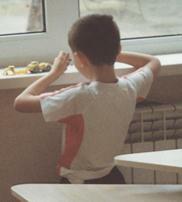 As soon as an attendant stepped away, the child kneeling at a window at left seemed to become obsessed with some small toys and would not respond to a request from a teacher that he engage in other activities. The school also will need to create an indoor fitness and physical education center in available space and improve the fence that already encloses most of the school yard. Additionally, they need to obtain more sensory toys, which, Ms. Struchek observed, are available in Israel. Although the school had not yet been open for a full academic year, some children already have made remarkable progress. Some now speak in full sentences, express preferences for certain activities, and even say ‘thank you’ at appropriate times. The progress is visible to teachers and parents alike. Parents can observe their children at almost any time through a password-protected website that monitors children in most activities. Ms. Struchek said that she hoped parents would mimic teacher interaction with the children so that parental behavior is both constructive and consistent with that encountered by their children in the school. An autistic child, assisted by an aide, presents flowers to Mrs. Markovich. Rabbi Markovich is seated behind his wife. The man to the right of Rabbi Markovich appears to be taking a photo with a cell phone. Photo: http://www.cwf.com.ua/. Retrieved July 26, 2011. Ms. Struchek and Mrs. Sergienko said that tuition for each child enrolled at the school is $2,000 monthly; however, they said, very few families pay the full fee. The school is actively seeking sponsors. Their major expenses, Ms. Struchek continued, are $5,000 weekly for 12 teachers (some of whom trained abroad) and $10,000 monthly in facilities charges (rent paid to the city for the building) and utilities. Completion of the fence that partially encloses the school yard will cost $25,000. Ms. Struchek and Mrs. Segienko stated that all concerned with the school are committed to establishing and maintaining an institution of excellence, one that will become a national center for the teaching of autistic children. They already are advising families from out of town, most of whom bring their children to the school periodically. The school develops work plans for the parents to use in working with their youngsters at home; communication with out-of-town families is maintained through password-protected web conferences. It also offers parent education for both local and out-of-town families. The school intends to teach master classes to other professionals. In the meantime, the two women continued, they openly acknowledge their own need for professional development. An expert in the field from San Francisco was scheduled to come to Kyiv in the near future for a week of lectures and evaluation at the school. The school paid for her transportation and hotel accommodations, but she had agreed to provide her consulting services without charge. They are eager to receive training and guidance from other sources as well. 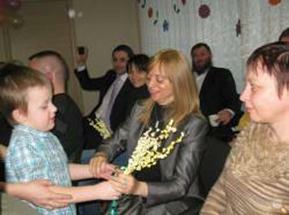 A probably distant dream, added Mrs. Sergienko, is development of a camp/resort for autistic children and their families. She is aware of a suitable site near Kyiv, she said.